In 2019 the Chinese new year celebrations in Yokohama run from 4th February through to 19th February. There are a wide range of events taking place as part of this. The festival starts with a countdown on the evening of 4th February, The Lion dance (Toao (Tsuaichin)) on the 5th February. 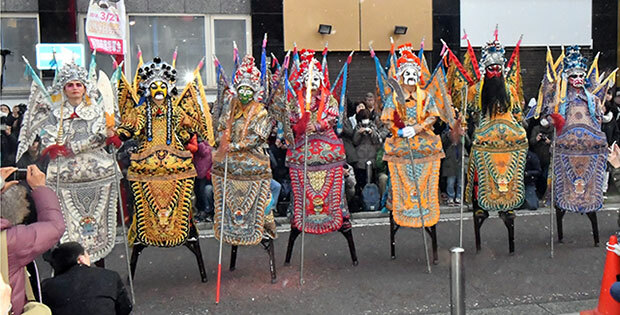 On the 16th February there is the Iwaimai Sleepwalking (Zhu Yuko Kumai) where people dressed as dragons and lions perform a dance on stilts throughout Chinatown. The festival closes with a lantern festival on February the 19th form 5.30pm to 7pm at Yokohama Mazu Temple. There are many other events taking place during the 2 week period. Yokohama Chinatown is around 150 years old. After Japan re-opened its borders to the world, in the 1850s, many Chinese traders settled in the port city of Yokohama. Then much later on, in 1955, after the war had ended, Chinatown once again began to grow and a large goodwill gate was built. That is when the Chinatown was officially recognized and officially renamed Yokohama Chukagai: Yokohama Chinatown. Today only a few Chinese people still live in Chinatown, but it has a population of about 3,000 to 4,000. Most of the residents are from Guangzhou (Canton) but many come from other regions. Yokohama Chinatown is the largest Chinatown in Asia. There are roughly 250 Chinese-owned/themed shops and restaurants in the district, with the highest concentration centered on a 300 square metre area.